Stephanie and Matt’s April wedding was a gorgeous affair, complete with family, friends, and their adorable pup! While their wedding design was timelessly chic, this fun couple incorporated their personalities throughout the day in order to have a wedding that was as unique as their love. Stephanie stunned in a strapless Watters dress with lace detailing while her husband proudly wore his Air Force uniform and donned some dapper shades. Their pup, Chubby, was truly a star in his own right with cuff links just for the occasion! After a romantic First Look in the garden, the couple exchanged vows under the gazebo. For their reception, gold lanterns and blue linens donned the tables in the event pavilion. 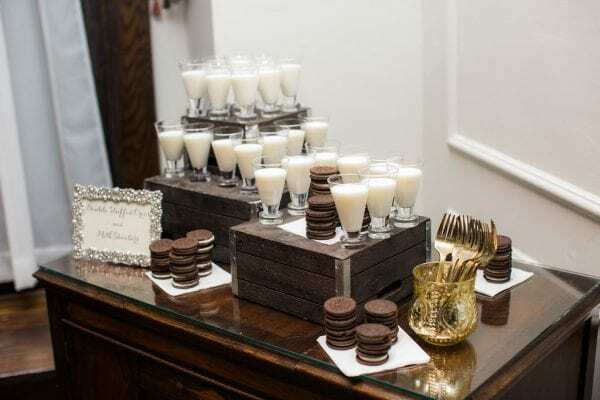 Their “Love at First Swipe” cake topper was a sweet homage to how the couple met online, while their Oreo Dunking Station showcased the couple’s favorite sweet treat. The night ended with a beautiful sparkler sendoff as the new Mr. and Mrs. celebrated becoming husband and wife. These photos were captured beautifully by Caley Newberry. It was truly a magical day!